Home/Articles/Stem cell and skin care. It is astonishing how the cosmetic industry uses medical discoveries and put these formulas into skin cream jars. In 2009 the American company Voss laboratories was the first that introduced stem cell active ingredients into a cosmetic product. Due to the fact that the company didn’t reveal their secret ingredients, it created a worldwide rumor that the company might be using human stem cells. The world started to question if this would be ethical and safe. Coming from the medical stand point: with human stem cells you can actually build and rebuild human organs but also carcinogenic cell. For that reason it created great concerns. Adult or somatic stem cells exist throughout the body after embryonic development and are found inside of different types of tissue. These stem cells have been found in tissues such as the brain, bone marrow, blood, blood vessels, skeletal muscles, liver, and the Skin ( basal layer and fat layer) . They remain in a quiescent or non-dividing state for years until activated by disease or tissue injury. Adult stem cells can divide ( copy) or self-renew indefinitely, enabling them to generate a range of cell types from the originating organ or even regenerates the entire original organ. Plant Stem Cells benefits human skin. Stem cells from a rare red grape variety provide the basis for Israel based company On-Macabim latest skin care ingredient. This variety is one of the few red grapes that have red flesh and juice – the majority have red skin but white flesh and juice – which is due to the high quantity of anthocyanins in the fruit. The anthocyanins, also present in the flesh, leading to higher antioxidant levels overall. The technology was developed last year and allows to extract stem cells from the plant which can then be formulated into a cosmetic ingredient to help protect the stem cells in human skin. To harvest the stem cells the company first induces a wound in the plant which causes the surrounding cells to dedifferentiate (turn back into stem cells) and form a wound healing tissue called a callus. According to On-macabim, these plant stem cells contain components and epigenetic factors that can protect human skin stem cells form UV radiation, inflammation, oxidative stress, neutralize free radicals and reverse the effects of photoaging. 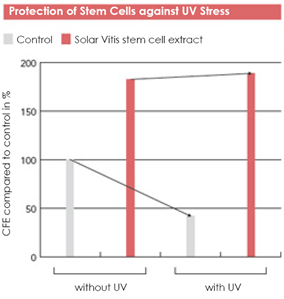 Stem Cell Colony Efficacy (CFE) and GrowthGraph shows the superior ability of grape stem cell extract to protect epithelial stem cells against UV stress, the leading cause of skin aging.Applied over time, grape stem cells will help diminish fine lines and wrinkles while improving skin tone and texture. their power to regenerate will be jeopardized. 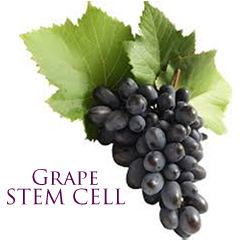 Grape stem cells have the ability to promote healthy skin proliferation. Some were exposed to UVA+UVB-light; others were unexposed. CFE was determined in each case. when skin stem cells were exposed to UV radiation (control). However, the presence of the Grape Stem Cells counteracted the negative effect of UV radiation on the cells as the CFE remained at the same level when exposed to the UV radiation. Therefore, the Grape Stem Cells protect skin stem cells against UV stress.